Turnouts, turnouts, everywhere. 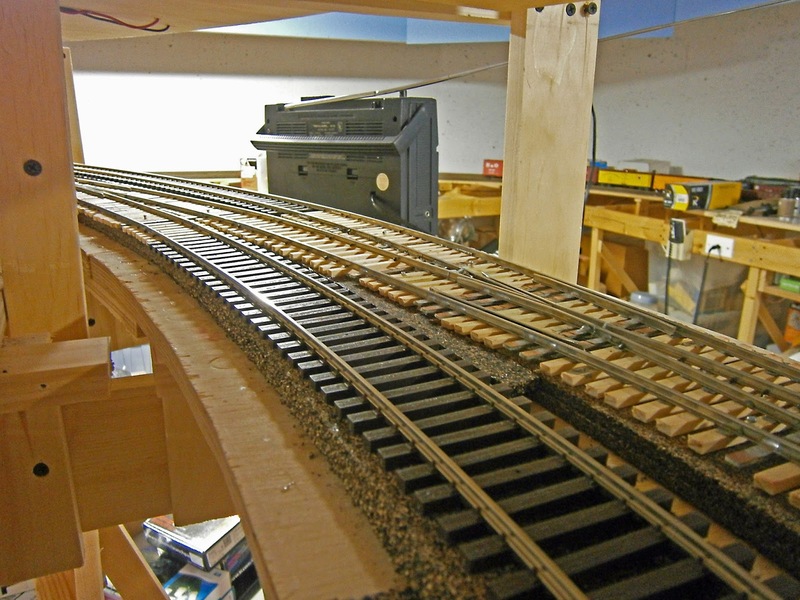 And curved turnouts at that. I haven't posted in a while because I have been spending every available hour (which aren't many) either working on the layout, or building projects for the LaunchPad for Model Railroading blog. In my haste to get ready for my last open house (I can't believe that it's coming up on a year now) I made a couple of stupid moves. One of which I documented on this blog. I built a double crossover for the entrance to the helix, without measuring first whether it would fit (See The Scissors Crossover and Setback!). 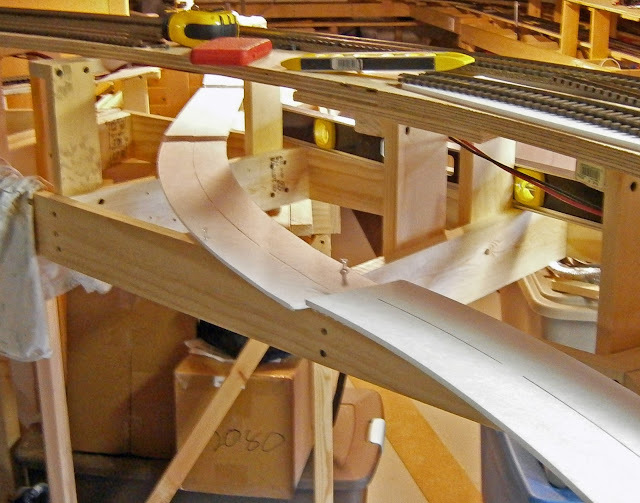 To make up for this mistake, I put a single curved turnout into one track on the helix as a placeholder for a curved crossover to take the place of the abortive scissors crossover and I proceeded to build the helix on top of the location of the future curved crossover in order to have some progress to show for my April 2012 open house. I knew this was not a smart move and that I'd have to pay for it later; well, now is later. 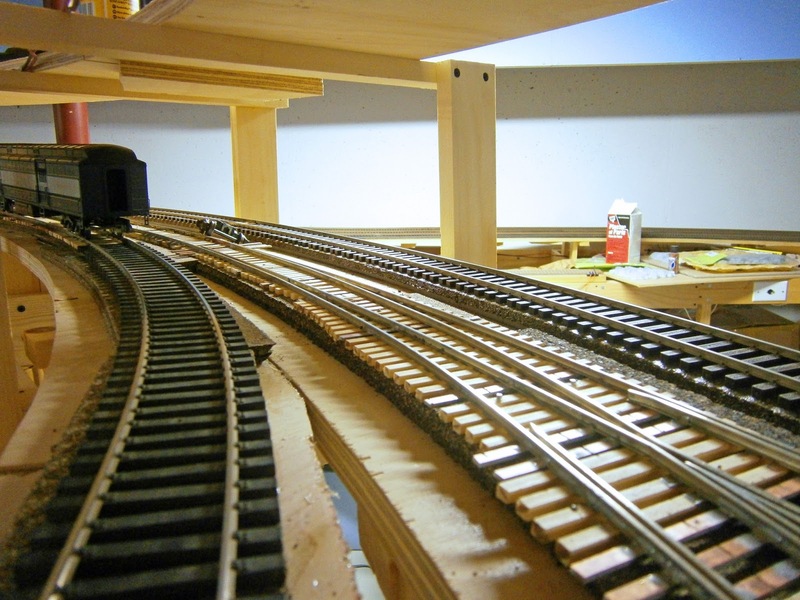 During 2012 I built a couple of more curved turnouts to finish the crossover as well as the entrance and exit from hidden staging (soon to be renamed lower staging). Since January I've put those into place. You'd think that my first run-in with a misfitted turnout would have taught me to "measure twice". Unfortunately, no. After finishing the curved crossover, which was fixed in place when I put the first switch down in April of 2012. 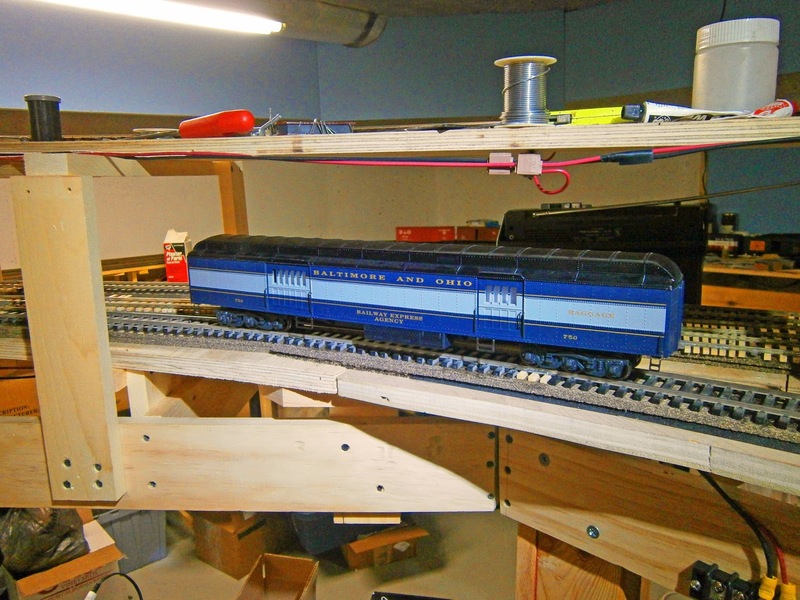 I found that the curved turnout that would lead off into hidden staging would not fit where I had intended for it to go. It wasn't a question of rebuilding the turnout; no turnout (of any acceptable diverging radius) could avoid an unacceptably sharp reverse curve at that location. So I had to move the turnout further up the helix to the location where I wanted to put another turnout leading from hidden staging. As a result the turnout for the track coming out of hidden staging is further up the helix and closer to the lead-in track so that an unacceptable grade and a fairly bad reverse curve results. 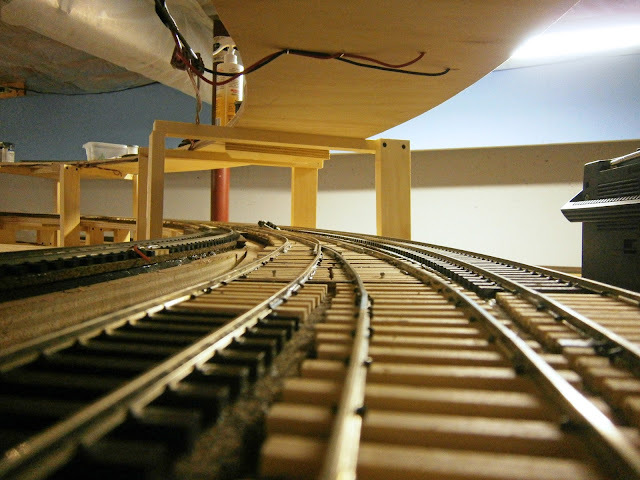 I now have a beautiful sweeping track leading into hidden staging and a short, steep, contorted track leading out of hidden staging where it connects to the helix. 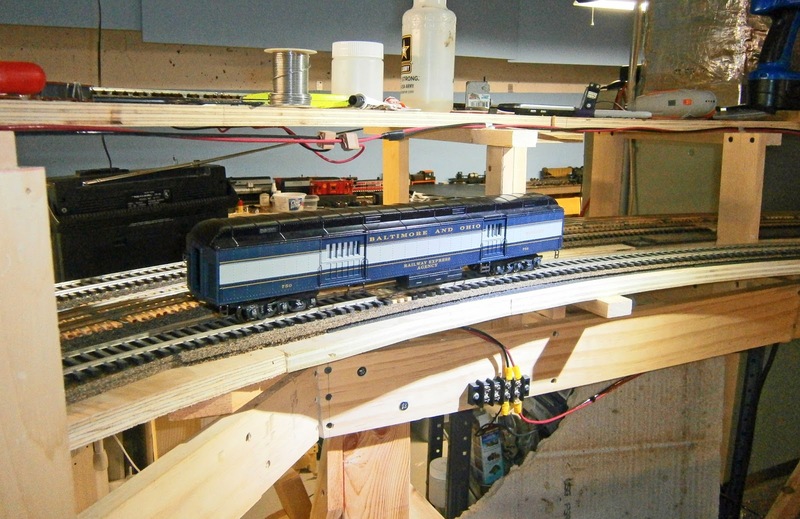 Has anyone ever heard of someone who built staging that needed helpers to get trains out of it? I kick myself because I should know better; and I knew at the time that I was potentially making mistakes. Not the least of which I now have to build a fairly complex switch plant between the turns of the helix. Which, among other things, required that I relocate some of the helix supports which were now standing where track had to pass. Enough of the kevtching already! Let's look at some photos. 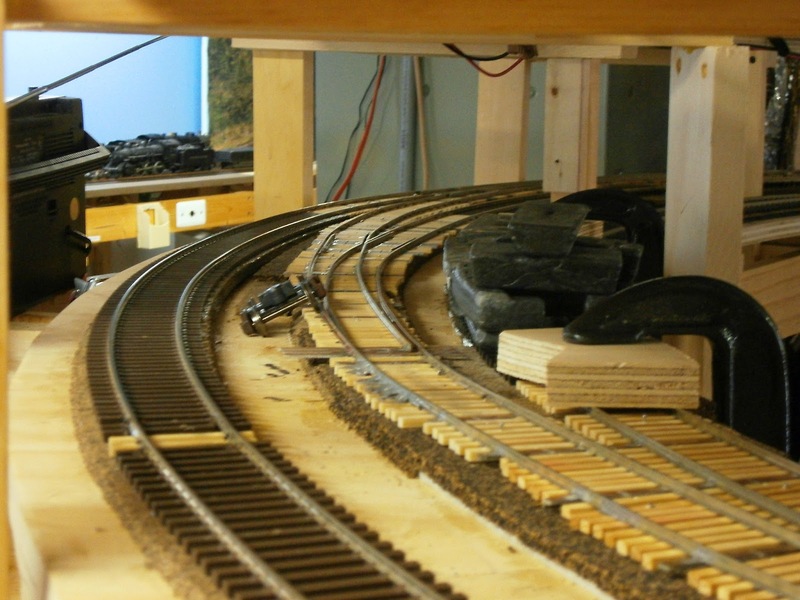 The connection of the track leading into hidden staging, shown in the last blog post has been completed. Here are a series of shots of the passenger car, now able to run all the way to the inner track on the lower level of the helix. 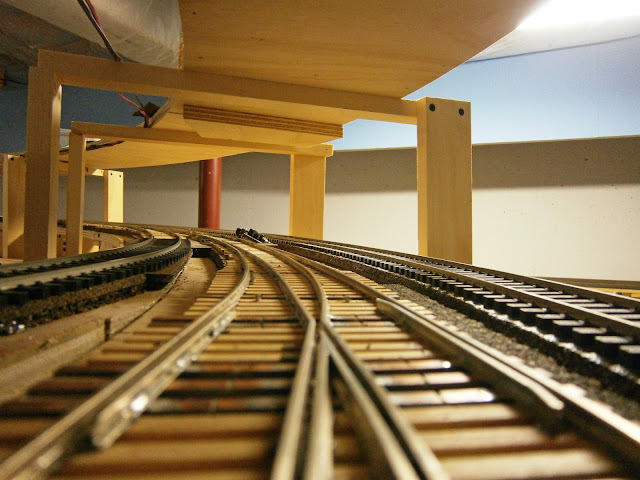 This last shot is how my 1/48 scale track gang sees the car merging into the lower level of the helix. 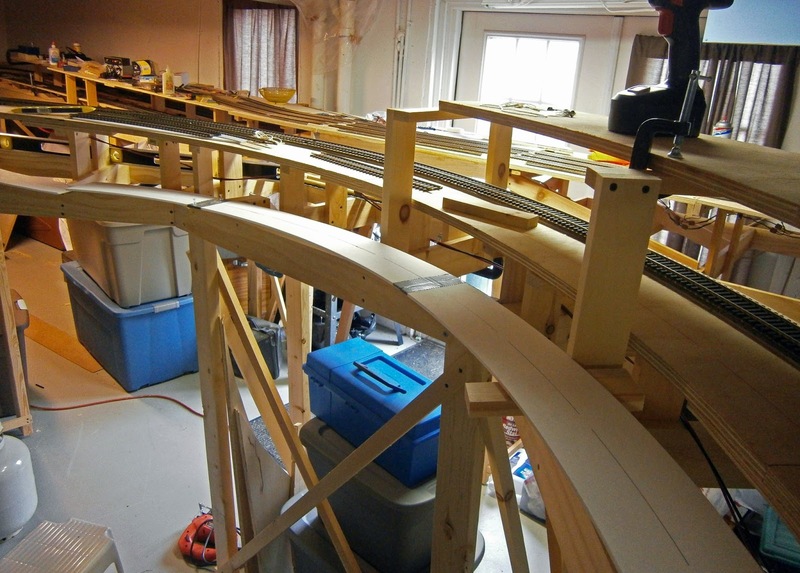 Here we're at the beginning of the curved crossover looking uphill on the helix from the inside. Across the aisle is M&K junction and some standing trains. The crossover goes between the outer and the inner track on the helix; it's facing point. About mid-way through the curved crossover here. 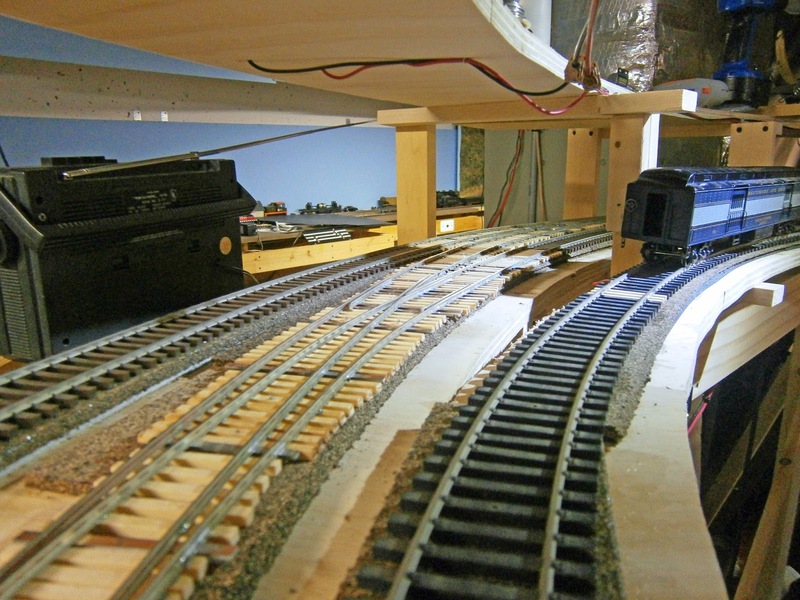 The completion of the crossover plus the track into hidden staging is visible on the left. Beyond the foreground, on the opposite wall of the basement, is Cranberry grade. 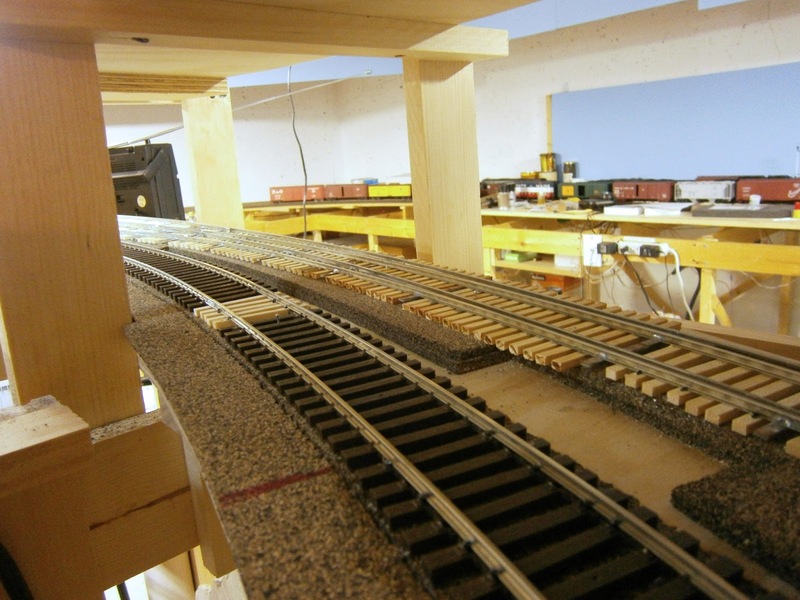 Here are a couple of views looking downhill somewhat earlier during construction and the track to staging is clamped and weighted waiting for the glue to dry. Finally a couple of track-gang level views. All of these turnouts are hand-built and, no, they don't have four spikes per tie. Most of the non-PC board ties are glued on because these will be hidden under scenery to the viewer in the aisle. Guard and wing rails are extra long to capture the wheels long before and after they pass the frog. 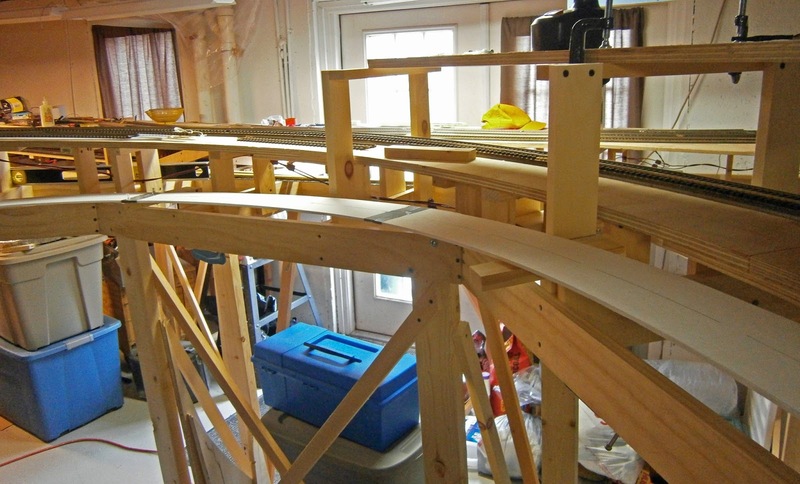 Over on the other side of the helix, the approach track from hidden staging was mocked up in foam core (as was this track) because I could not use my beam compass to lay out the curves (too many obstructions). Here are some pictures of how that looks. In the very busy shot above, the lower turn of the helix is shown with one track in place. 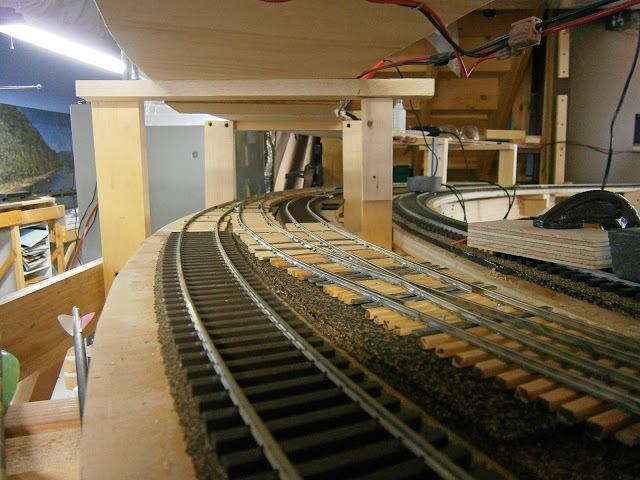 The current end of track on the helix is right where you can see the base of a cordless drill. The support structure for the second turn of the helix does not extend beyond this point. In the middle ground you can see the foam-core mock-up of the track out of hidden staging. It will join the lower turn of the helix off camera to the right and behind the photographer. Follow it left and you can get a sense for how fast it has to drop. 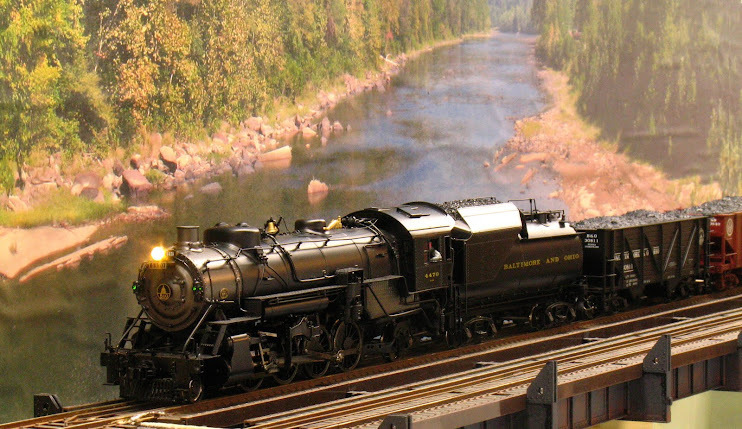 The grade will face approaching trains. The grade can be seen in this somewhat more sideways view. Although it's somewhat exaggerated by the wide angle setting on the camera's lens, the drop really is steep. Although I have not adjusted the foam core to final grade, it calculates out to something near 4% between where it will join the helix and where it ducks under the helix. Adding insult to injury, the current alignment has a reverse curve with no room for a straight section between the curves - a no-no according to John Armstrong. As you can see in this shot. Where the two pieces of foam core are disconnected, one curve butts against the other with about an inch between them. I think that I can realign this section to get some tangent between them, but will it be enough? you must get a tangent section between those two curves or you will be sorry.